The Choetech Fast Wireless Charging Stand is great value for Apple users looking to take advantage of fast wireless charging without breaking the bank. Smartphones are cutting the cord thanks to manufacturers integrating inductive (wireless) charging technology into their devices. This means you no longer need to plug in to replenish a depleted battery, allowing you to use devices like the Choetech Fast Wireless Charging Stand to keep your phone topped up and accessible. This is particularly compelling for Apple users because the company recently included wireless charging on all their iPhones newer than the iPhone 8, but there’s no “official” Apple wireless charger. That leaves the market open for various third-party accessories, including ones from Chotech which boasts a variety of wireless charging options. We tested out the Fast Wireless Charging Stand to see if it lived up to their claims by evaluating the design, charging speed, and price to see if it would be the best buy for consumers. Made of black plastic, the Choetech Fast Wireless Charging Stand sits your phone upright and looks pretty minimalistic on your desk. Inside, it has two transmitter coils which allow your phone to charge in any position you place it in. The advantage of a wide charging area lets you place your device in either landscape or portrait while it powers up. A bottom lip holds your phone secure. The angle is perfect for interacting with your device as it charges: from unlocking your phone with Face ID, checking messages, watching videos, taking calls, and listening to music. At the base of the stand, there’s a set of dim LED indicators that let you know that the charging is working its magic and replenishing your phone battery. Choetech includes a user manual, but it is not necessary as the setup process is quite straightforward. Inside the box, a USB cable you attach to the micro USB port on the stand is included. An AC adapter is not included, so you will have to use your own. You’ll want to make sure it’s a fast-charge compatible adapter so you get the promised speeds. With that done, you simply put your device on the stand and your phone starts charging. During our testing, the Chotech charged our fully drained iPhone XS Max in 2.5 hours. During our testing, the Chotech charged our fully drained iPhone XS Max in 2.5 hours. It also managed to do it without getting unduly warm, which was an issue we encountered with other chargers we tested. We found we could charge on the stand with phone cases as long as they weren’t thicker than 4mm. The manufacturer does suggest removing the case for higher efficiency charging. Choetech says the stand fast charges at 7.5W for the following Apple smartphone devices: iPhone Xs/Xs Max/XR, iPhone X/8/8 Plus. The 10W fast charging mode is reserved only for the Samsung Galaxy Note 9/S9/S9 Plus/Note 8/S8/S8 Plus/S7/S7 Edge/S6 Edge+/Note 5 when using the Qualcomm Quick Charge 2.0 or 3.0-compatible adapter. The Huawei Mate 20 Pro/RS, S6/S6 Edge charge the slowest at 5W. The Choetech Fast Wireless Charging Stand costs $19.99 MSRP on Amazon, which is a great value. As of right now, Apple doesn’t have a proprietary charger that takes advantage of wireless charging, let alone fast wireless charging. In fact, the only “official” way to fast charge is by buying an 18W USB-C Power adapter which retails for $29 and a USB-C to Lightning cable (3ft) which costs an additional $19. If you add that up, Apple’s fast charging capabilities set you back $48 and don’t cut the cord. 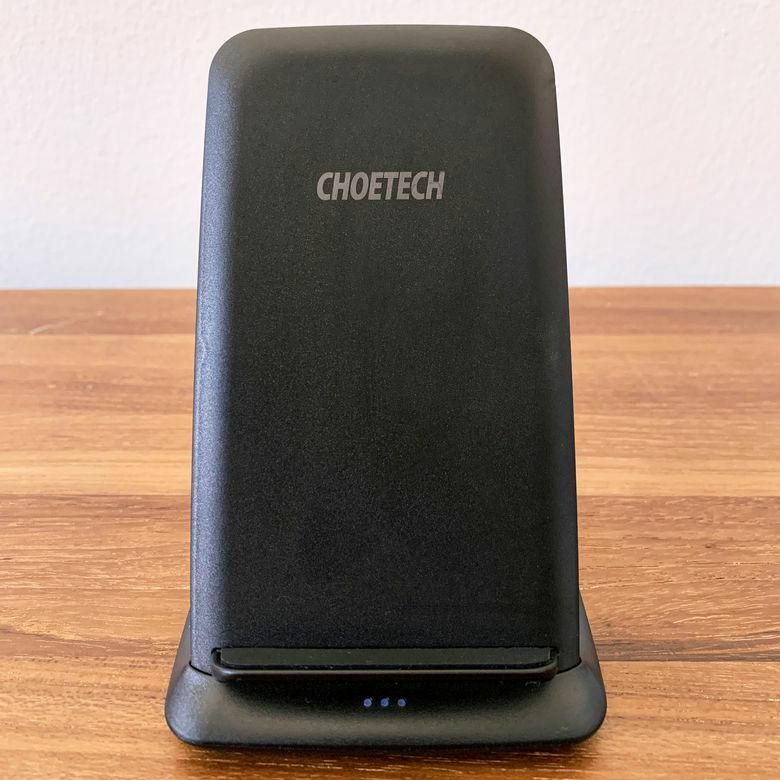 The Choetech Fast Wireless Charger Stand seems like a steal, but it does have many competitors. One of the most popular charger stands is from Samsung, which matches Choetech’s offering by using dual charging coils that similarly allow your smartphone to be charged in any orientation you place it in. Samsung’s Wireless Fast Charging Stand retails for $69.99, a significant increase over Choetech’s stand, however, it does come with a fast-charging power brick in the box as an added bonus. With the AC adapter included, it allows the customer to know they are using the optimal cable and brick to power up their device. For Apple and Android users alike, the Chotech stand is a great purchase. Two major downfalls for the Samsung stand is the power light that is extremely bright and can be a nuisance on your bedside at night, as well as its slightly lower max output of 9W. Choetech max’s out at 10W, and it’s LED light indicator is dim enough to not light up the entire room and keep you awake at night. Check out our other reviews of the best wireless phone chargers available on the market today. A fantastic charger for the price. The Choetech Fast Wireless Charger Stand offers great value to consumers looking to charge their phones wirelessly. The price is low enough that you can buy several to scatter around the house to ensure your battery never runs low. Product Dimensions 3.2 x 3.2 x 2.52 in.